We are proud to present the first book published by Curly Tale Books: Ta Da! The Quite Big Rock. Written by Alan Grant and illustrated by his daughter Shalla Gray, this lovely story follows the journey of a (quite) big rock who dreams of being ‘huge and very big’. Taking the advice of Samson seagull, the rock tries to find his way to the seaside but things don’t work out quite the way he’d hoped. 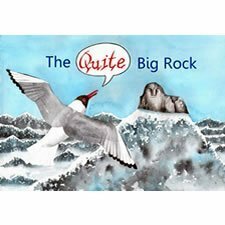 The Quite Big Rock is ideal as a picture book with beautiful illustrations for young children to follow whilst early readers will enjoy the comic book style of the story.